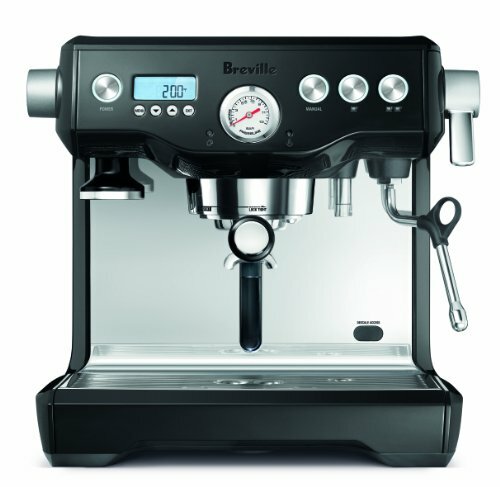 The Breville BES920BSXL Dual Boiler in Black Sesame offers commercial features and performance, in a domestic footprint. Espresso perfection requires precision temperature and pressure control, consistently, every time. At the heart of this machine is its dual stainless steel boiler heating system. The espresso boiler, for the espresso shot, is PID temperature controlled, while a separate steam boiler offers instant and powerful steam on demand. So you can extract your shot at the right temperature, delivering optimal flavor, while simultaneously steaming your milk to cafe quality. What's more, there is another element in the group head, ensuring the entire system maintains a consistent temperature. The Dual Boiler also features an Over Pressure Valve (OPV) which limits the maximum pressure throughout the extraction, preventing bitter flavors in the shot. It also offers a true low pressure pre-infusion, which gradually increases the pressure to gently expand the grinds for an even extraction. But there's much more to this machine for the coffee geek. Brew temperature and pre-infusion pressure and duration are all programmable. At the same time we've kept it simple with user-friendly features. An optional Auto Start setting preheats the machine at a programmed time; a top-fill 84 oz. (2.5L) water tank ensures easy access; and the dedicated hot water outlet makes it faster to preheat cups and prepare an Americano. There is also a shot clock and pressure gauge to help you improve your barista skills over time. The new Dual Boiler now includes a descaling function for cleaning at home, a Razor Dosing Tool for precision dosing and consistent extraction, plus a 2 year limited warranty. All you'll need are some freshly ground beans and a bit of practice to rival the best cafe.